The annual gathering of nerds in your town may have to change its name soon, as a judge in California has followed a jury verdict and ruled that Salt Lake Comic Con infringed on San Diego Comic-Con’s trademark of the “comic con” name. That comes from Deadline, which says the judge only awarded San Diego Comic-Con $20,000 in damages, but this sets a precedent for other conventions to be barred from using the “comic con” name—including New York Comic Con, which is coming up in a few months. Apparently, one of the things the judge really took issue with was the Salt Lake City con’s repeated insistence on reciting the dictionary definition of “con,” which the judge found “objectively unreasonable” because it had already been established that nobody really gave a damn about the dictionary definition of “con.” San Diego’s defense was that its been a non-profit since 1975 and has been holding conventions since 1970, meaning it does have an established history with the “comic con” name. That being said “comic con” still seems like a relatively generic term, so this whole thing reminds us of the “barcade” trademark issue. A bar that has arcade games is an increasingly common thing these days, but only one company actually owns the rights to use the name Barcade. That means other bars that have arcade games must be legally identified as “arcade bars,” so in that spirit, we’d like to make a pitch for an alternate name that comic book conventions can use without infringing on the “Comic-Con” brand: Comicvention. The Salt Lake Comicvention. 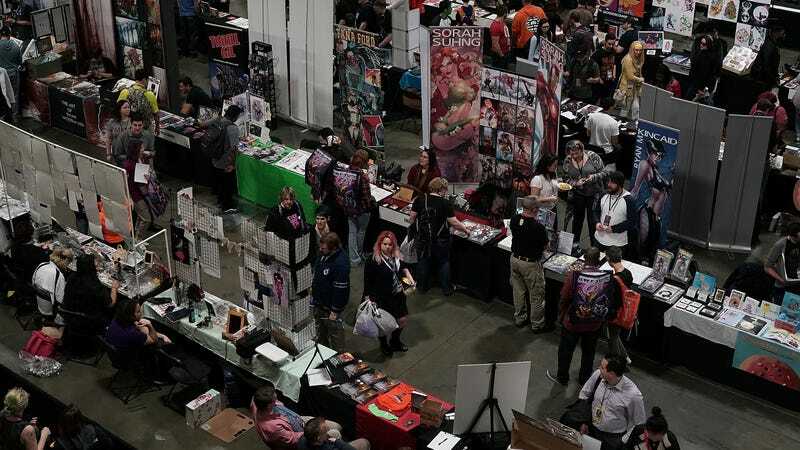 The New York Comicvention. It’s not terrible, right? Either way, a similar fight is now heating up in Boston. As reported by The Daily Beast, anime convention Anime Boston has filed a lawsuit against newer (and similarly named) anime convention Boston AnimeFest. One side is arguing that it had the name first, and the other side is arguing that the name is generic enough that it shouldn’t be trademarked. This issue seems less cut-and-dry than the other one, especially since we can’t come up with a catchy name like “comicvention” to slap in here. Really, though, the clear winner here is the city of Boston, which has enough anime fans to justify two similarly named conventions. Does everybody there wear a Naruto headband under the Red Sox hat? Pick up some Gunpla kits for us, Bean Town!